Big Sister Personalized T-Shirts make a wonderful gift when a new baby is born into the family. It adds a nice personal touch for the new Big Sister. Our Big Sister is available on our premium white 100% cotton T-shirt, machine washable in youth shirt sizes XS-L. Personalized Big Sisters T-shirts are also available on Pink or Ash Grey. Sisters gifts include FREE Personalization! 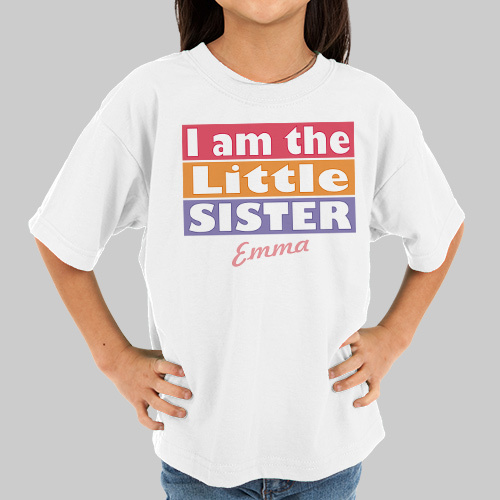 Personalize your Big Sister T-shirt with any sister's name and please specify little sister, middle sister or big sister. Additional Details GiftsForYouNow.com has a large assortment of Personalized Sister Shirts, Personalized Sister Frames & Personalized Sister Keepsakes, plus much more. All make wonderful Personalized Sister Gifts.